I have developed an aversion to healthy eating. For the third time now I’ve broken a tooth on an olive pit – or stone as we Brits call the little blighters more appropriately. I was aware there were unpitted olives in my salad but for all my careful scrutiny one must have leapt on to a lettuce leaf just before I shovelled it into my mouth. Add this latest disaster to a nasty cut thumb while struggling to open a sardine can and recently half-choking on a cod liver oil capsule, I’d have been far safer sticking to an exclusive diet of fish and chips. 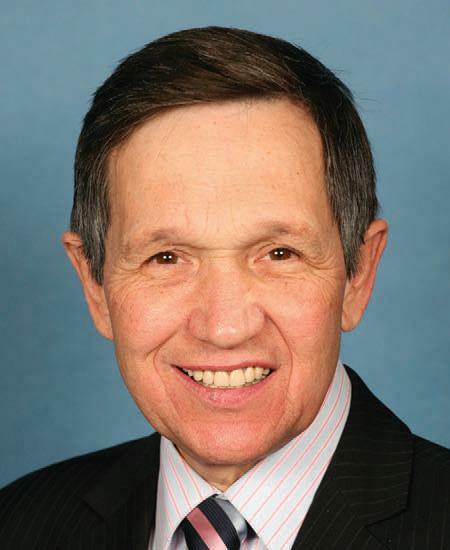 America’s blogosphere has been unsympathetic to the predicament of Dennis Kucinich (pictured above). He’s the US Congressman who accidentally bit into an unpitted olive and is now suing a House of Representatives cafeteria for $150,000. It’s taken a while for the lawsuit to surface but the claim for damages is on the grounds the vegetarian sandwich wrap he bought “was unwholesome and unfit for human consumption” because it “contained dangerous substances” — namely the olive pit. I know what he means. He suffered “serious and permanent dental and oral injuries" as well as “significant pain, suffering and loss of enjoyment. But $150,000! for an olive pit. It’s hardly in the spirit of the Old West. I’d have taken $150 if I could have blamed anyone but myself. To be fair to Rep. Kucinich he has every right to not find an olive pit in his sandwich. He describes himself as ‘America’s Most Courageous Congressman’ on his website. I imagine he has in mind his attempted impeachment of President George W Bush rather than the challenges presented by olive pits. There’s good stuff about Kucinich’s colourful background on this ABC News link. What's needed is more Popeye and less Olive from 'America's Most Courageous Congressman'.